Amber and the kids decided that since we didn’t do Wizard of Oz last year after mom died, we had to do it this year. I was very hesitant, I wasn’t sure if I handle the emotions. But I was overruled. When we were going to do it last year, Bass was going to be the lion (wearing the lion portion of Ezra’s manticore costume). But this year it no longer fit him. So we shuffled costumes around, and now Dae was the lion (wearing the lion portion of Bass’s chimera costume) That meant I now had to be the flying monkey, and Bass got to be my tin man. If I was going to have to do a theme I didn’t want AND be a character I didn’t want, I was at least going to do it scary! I had already started the tin man and scarecrow masks last year. But the tin man mask I had made for myself didn’t fit Bass, so I had to start over. At least Ezra’s scarecrow mask still fit him. 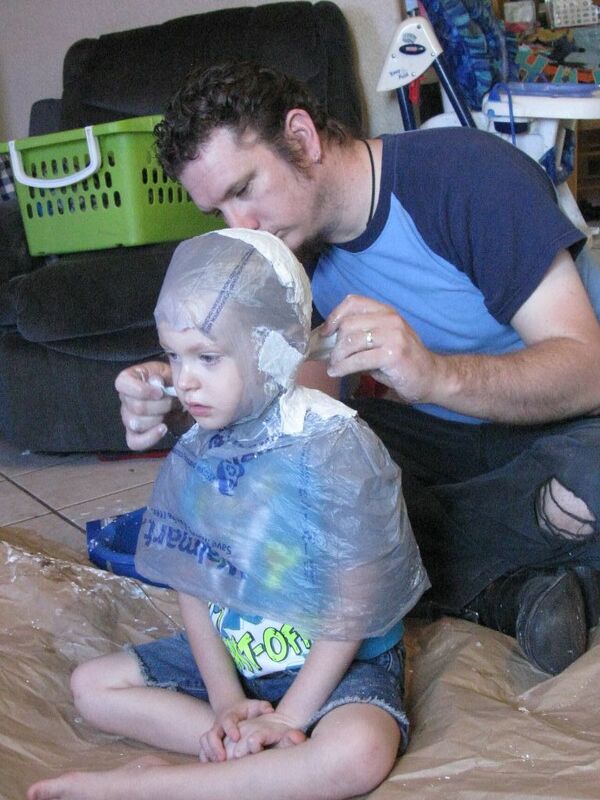 I searched online for info on making costume armor for tin man. I always hated the rubbery cloth from the original movie. I wanted him to be more like an armored robot! I found YouTube videos by people like “Evil Ted” Smith where they used EVA foam floor mats (for like yoga and working out) to build some amazing armor. This stuff is awesome! I will definitely incorporate it into at least one costume every year. My sister Katie decided to trick or teat with us, so she made costumes for herself and he kids to go along with our theme. Xander was the Wizard, Violet was Dorothy, and Katie was the Wicked Witch of the East, complete with the house that crushed her. We were all set to do Wizard of Oz this year. Amber had been begging to do it for years, and I finally gave in. We were just coming home from a Walmart trip to get supplies, when dad called. Mom had had a “massive cardiac event”. 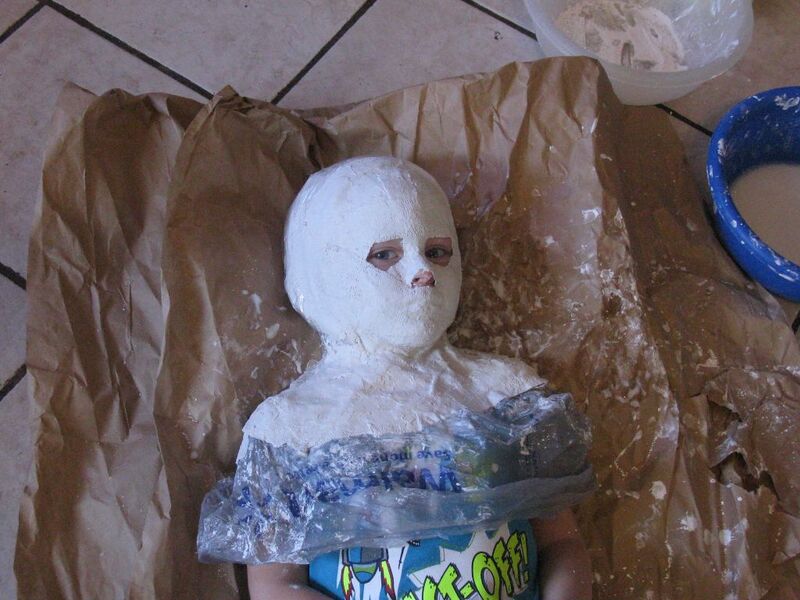 Needless to say I wasn’t interested in Halloween or making costumes anymore. As we got closer to Halloween, I told the boys that they could have store-bought costumes for the first time in their lives. They were really excited. Ezra decided to make his own Teemo costume with a hat he found on Amazon. Bass chose a scary jester. Dae found a ride on dinosaur costume that he asked if I could turn into a dragon. Amber bought a broken-doll costume. I saw a scary teddy bear mask that looked kind of lame, but gave me inspiration to make my own. I made the face look friendly, but when I opened the mouth, there were sharp metal teeth with blood dripping from them. It was great when kids would come up saying “Look at the cute bear!” and then I would “smile” at them and they would run away screaming. As soon as Daemon’s birthday rolled around this July, I knew it was time to start deciding on a costume theme. 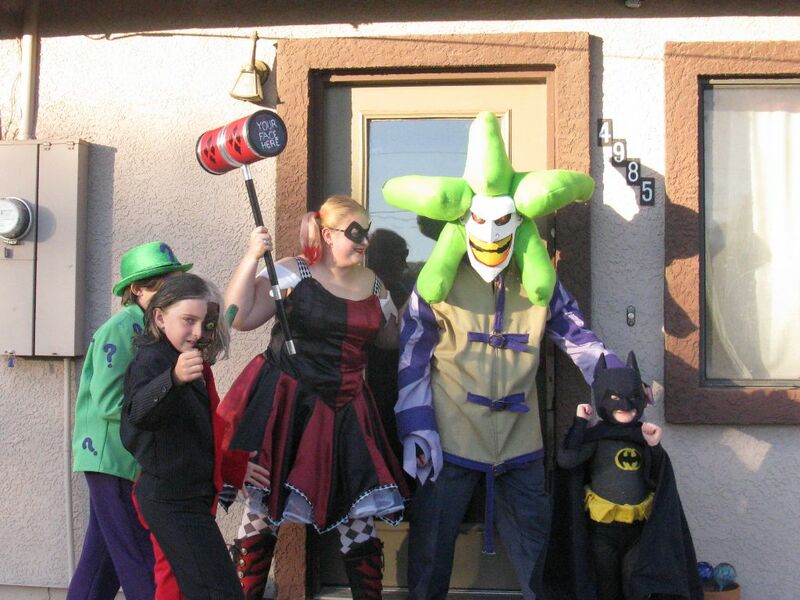 Daemon decided that he wanted to be Batman this year, so we all chose characters around that. Ezra decided he wanted to be The Riddler. Bass chose two-face. Amber was torn between Poison Ivy and Harley Quinn. Since the boys insisted I be The Joker, she felt Harley was the right choice. I started Daemon’s helmet right away. I considered just using cloth, or maybe latex, but decided I wanted something stronger. I found a pepakura file for a Christopher Nolan “Dark Knight” style helmet. I scaled it up, printed it out, and cut it out of cardboard. About 6 hours of trimming and hot gluing later, and I had a perfectly fitting cardboard helmet. To keep it together a little better, I paper mached it using quilted paper towels. I wanted to paint it black, but Daemon insisted “no daddy, I want to be Blue Batman!” I went through tons of pictures of all of the different Batmans, and could not convince him that Keaton’s Batman, or even Christian Bale’s Batman, were better than Adam West. I finally got him to agree on Frank Miller’s “Dark Knight Returns” Batman. Dark Blue on Dark Grey. Luckily I still had some dark blue felt from my Skeletor costume years ago. I coated the helmet in it, and made a nice ribbed cape. To make sure Dae’s helmet would fit after it was coated and I had made the neck piece, I made a cast of his head and shoulders. 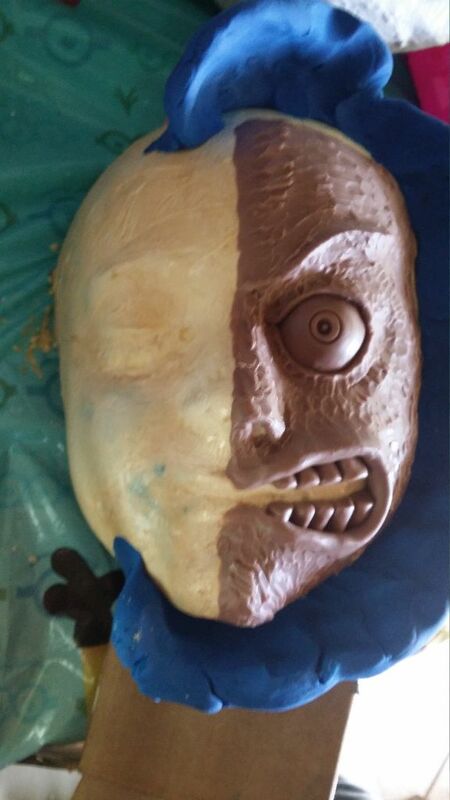 I also made a cast of Bass’s face to model his half-mask on. 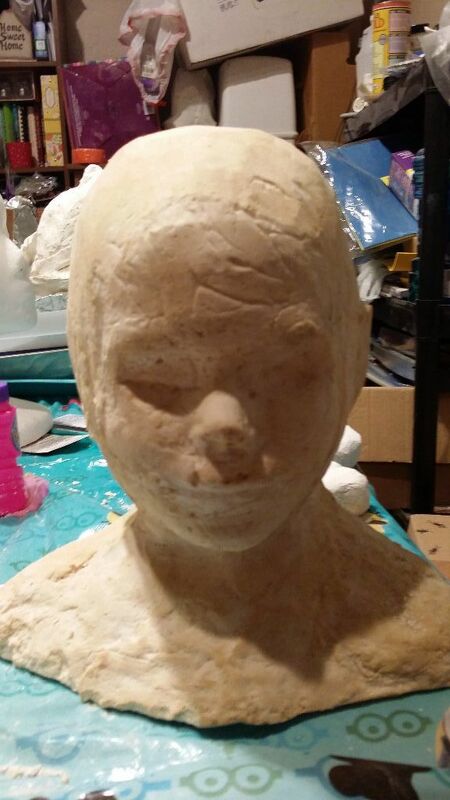 I have some blue modeling clay that I have used for years, but I really don’t like how soft it is and how easily it deforms with the lightest touch. I have read about “Monster Clay” for years, and finally decided it was time to get some. It is AMAZING. It is like a cross between wax and clay. 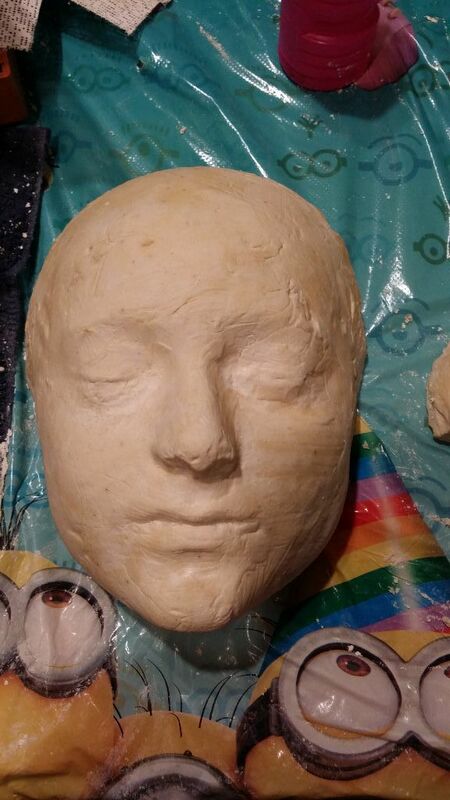 It is very stiff, and can be cut and shaped with tools, but you can microwave it, or warm it in your hands for a few minutes, and it works like soft clay. I modeled a creepy half-face with a bulging eye and exposed teeth for Two-Face. Looking online for a cheap alternative to foam latex, I found several people using common unflavored gelatin. The recipes all varied, but were basically a mix of gelatin, glycerin (at Walmart in the medicine department), sorbitol and water. Sorbitol is an artificial sweetner, and is supposedly not too hard to get ahold of, but I could not find it anywhere. I finally found a YouTube video where they said to use sugar-free pancake syrup. The main ingredients in that are sorbitol and water. I mixed them all together, poured them into my plaster mold, and waited. To my surprise, it came out great. Since gelatin is made from animal skin, it felt very flesh-like. It could also be melted and re-used. I swore I would not sew another suit for the boys after last year’s Doctor Who. Cutting down a men’s (or women’s) suit to fit a child is a pain. After several months of searching thrift stores for a child’s green sports jacket, and two contrasting suits to cut in half for Two-Face, I had to give up. I found a women’s XL green blazer that I cut down for Ezra. For Bass, he already had a blue pin-stripe from last year. 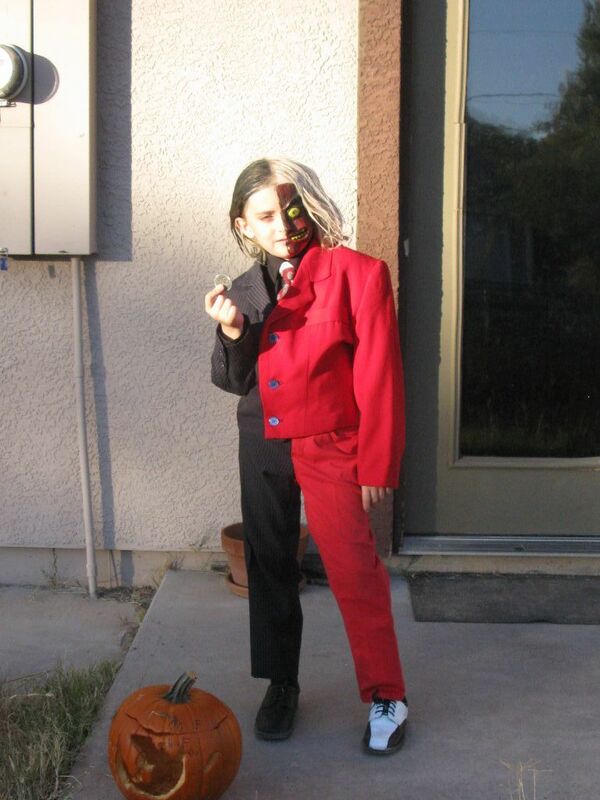 I cut it in half, and then found a nice bright red blazer at Good Will that I cut down to fit him. I tried to make him a matching pair of pants from the other half of the blazer, but there wasn’t enough material, and it ended up with weird seams and poofy parts. We finally found a pair of red women’s capris that were misplaced as little girl’s pants. I cut them in half, and they matched the pin-stripe pants almost perfectly. 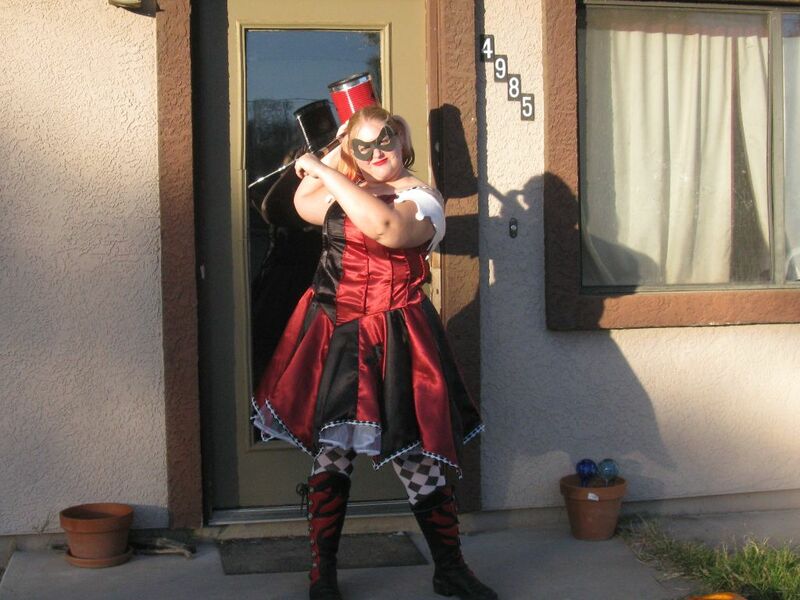 We went through quite a few Harley Quinn designs before Amber and I agreed on something. Most designs were a tight spandex bodysuit, but she is much more comfortable in a dress. She really wanted an 1800’s style dress, but it was just WAY too much work. We found a 1950’s style dress and a circus style dress that we liked, so we combined the two into a final design. Using the duct-tape technique I have used for duct-tape dummies in the past, I created a bodice/corset design to perfectly fit her. I then pinned paper triangles of increasing size around her to create the skirt. 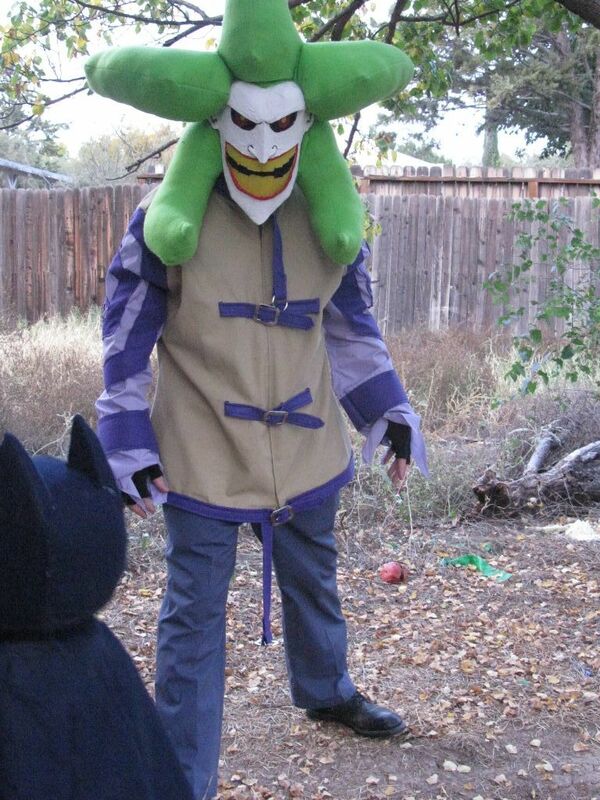 I was really not feeling up to being Joker. I didn’t want to do the Heather Ledger Joker, since EVERYONE is doing that. I considered doing the Jack Nicholson Joker, but could not find a purple suit ANYWHERE. Even online, there was nothing under a few hundred dollars. Going through all of the Joker iterations without a purple suit, I really liked the New 52 Joker. He has gone insane and peeled his own face off, and then re-attached it with wires. Everyone insisted it was WAY too scary, and would leave small childr en completely scarred. I finally decided on the animated “The Batman”‘s rasta Joker, with crazy green dreadlocks and a huge yellow-toothed smile. He had a straight-jacket and blue prison pants instead of the purple suit. I started cutting and gluing soda boxes into a basic Joker face, and it felt very familiar. I was building a piñata for my head! I paper mached it using the smoothest paper I could find: an old roll of TP that the dogs had destroyed. It went very quickly, and by the time I finished it, I was totally in the Halloween mood. We were getting sick of going to Uptown Sedona every year, so Isis suggested we go to Old Town Cottonwood this year. The Old Town shops would be giving away candy just like Uptown, but there was also a Fall Carnival with “rides for the kids and tons of treats”. It also had a costume contest for 2 to 7 and 8 to 12 year olds. As awesome as all of that sounded, the night was anything but. Trick or treating started at 5:00pm, and was supposed to go until 8:00pm. We got there around 5:45pm, and 3/4 of the shops were already closed. 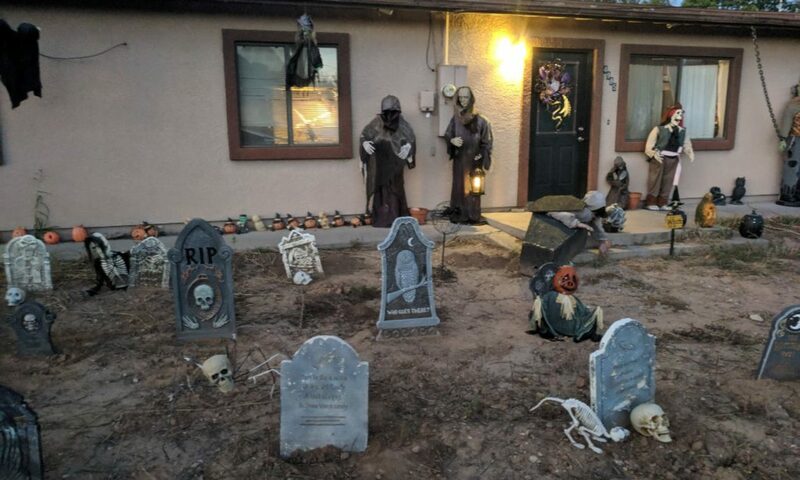 Not sure if they had run out of candy, or just closed down before anyone got there so they wouldn’t have to buy candy. Judging by how small the crowd was, I doubt they ran out. After the 10-15 minutes it took us to go to the few open shops, we headed over to the Carnival. It was on one of the little league baseball fields. There were 5-6 bouncy castles, a seemingly un-manned radio remote truck playing a loop of halloween-ish music, 2 light poles providing not nearly enough light for the field, and one little card table where some dude was selling hot cocoa. There was no obvious sign of anyone in charge, and more importantly no sign of my promised “tons of treats”. T he boys didn’t seem to notice the lameness, and were excited to bounce in the castles. We had to strip off their horns, wings, and hooves so they could go in. I did this more to protect the costumes than to follow the rules, since there wasn’t anyone manning the entrances like there usually are. I finally saw a dude wearing jeans an a t-shirt that might have been working there, but I’m not positive he wasn’t just a dad that enjoyed yelling at other peoples’ kids when they misbehave in the jumpy castle. The horns, hooves, wings, and vests were getting somewhat cumbersome to carry around from castle to castle. So Am suggested I put them in the car until the contest. BAD IDEA! Halfway to the car Ez’s horns fell and snapped in half. Then as I was opening the car door, Sebs’ horns fell. At first they seemed ok, but then as I was putting everything in the car, I felt a crunch under my foot. A piece had broken out of the side of one of his horns, and then crushed into several smaller pieces when I stepped on it. Luckily I had brought a hot glue gun, just in case something happened with one of the costumes. I searched around for an electrical outlet, and ended up in the men’s room, on the floor right by the door. Several guys came in and looked at me like I was crazy while I squatted there, waiting for the glue gun to heat up. By the time I finished gluing everything back together, it was time for the costume contest. I quickly got the boys back into their costumes and rushed them over to the stage. It was a very dimly lit, rickety old stage, that had probably been built in the late 80’s. A single dude with a microphone asked everyone everyone to line up on stage. A young girl that must have been his daughter was going through a cardboard box full of plastic trophies. I looked around… Where were the judges? Then he explained the rules: “There are 3 categories: scariest, prettiest, and most original. When I put my hand over a costume you like, yell.” So this wasn’t so much a COSTUME contest, as a POPULARITY contest. We definitely weren’t going to win prettiest or scariest. But we should at least be able to get most original. The first category was scariest. He went down the line, and some not so scary princesses got some cheers, but it came down to a scary clown and a mexican girl that looked like Lily from the Munsters (long black hair, a black cape/dress, and white face makeup with black lips and eyes) He went back and forth a few times, and the witch-girl ended up winning. Not the way I would have gone, but there were a LOT of mexicans, maybe they’re not a fan of clowns. The next category was prettiest. He went down the line, and I was amazed when this pretty little girl who was a Peacock-Fairy only got a few cheers, probably from her mom and my family. (I might have been a little biased since she and her mom came up to us earlier in the night and complimented our costumes). The dude with the mic kept going down the line, stopping over little girls in princess outfits. Then from the crowd you could hear “the dinosaur, the dinosaur!” He stopped and went back to a little 2-3 year old mexican boy in a dinosaur costume. The crowd went crazy. Needless to say the dinosaur won for prettiest costume. This was not a costume contest, it was a “who brought the most mexicans” contest. Any hope I had of the boys winning most original was gone. I hadn’t brought ANY mexicans with me. We left the Carnival with nearly no candy, and feeling like the night had been wasted. Next year we’re going to Clarkdale, where Gabe’s kids made out like bandits. Either that or I’m stopping by Windsong to pick up a few amigos for the costume contest. I had everyone try out their costumes the day before Halloween to make sure I hadn’t missed anything. Being the cheapskate that I am, I chose to do the decorations. Over all it didn’t come out too bad. After seeing it all together, we could use a few more props. We plan on making some more grave stones after halloween, and I hope to find some closeout props online. Maybe some animatronic skeletons or something.